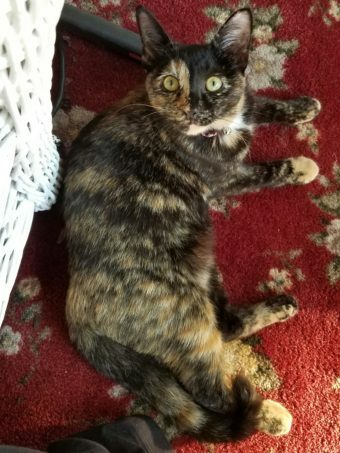 Jovie is a 10 month old spayed female tortoiseshell. She has a distinctive half light, half dark face, and is microchipped and has all her claws. She was last seen in unincorporated southeastern Algonquin, along the river on Winaki Trail. When lost, she was wearing a green safety collar with Christmas tree pattern and a bell. A generous reward is offered for information leading to her safe return. Please call Laura at 847-428-8485 or 847-638-8485.